A follow-up to The Lazy Mans Guide to Enlightenment or perhaps a final revision to it. 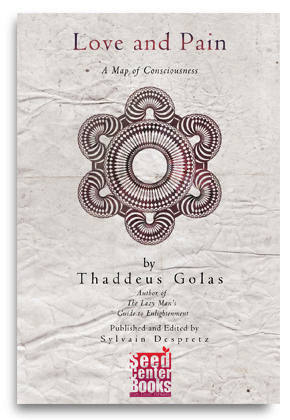 The Guide is still very significant to all those who sense the consciousness with which it was written but Thaddeus goes deeper with this new writing; he wanted leave behind a blueprint of his metaphysics that would withstand the test of time, beyond the euphoria of the '60s. He was, after all, a self-described hard-nosed critic of the many charlatans of the New Age; he didn't settle for benign therapies that passed for 'spirituality.' For all the comfort that an uplifting book can bring to our imagination, Thaddeus Golas wanted to write a text that he would like to find for himself, or give to a good friend; information that is solid, and that can be relied upon, even when the Universe fails to sustain all our fondly held beliefs about it. "I am a destroyer of ideas," he proposed, "and whatever I could not destroy is in Love and Pain." Love and Pain is a major work, intricate and subtle. It is an audit of our beliefs, and a wake-up call. It is also revolutionary! In time, it may come to be seen as one of the most important metaphysical books ever written; it is sure, at the very least, to illicit strong reactions from readers. "Why is our spiritual understanding of so little help to us as human beings? Why do we vainly pursue magical powers? Where do evil and pain come from? Is there a way to do it right? Is there something we need to learn to get away from here? what the spirit is and what it does. Some of the answers seem to work for a time. Some provide pleasant feelings. Some require impossible or impractical demands on human behavior. Many are pure folly, and some just whistling in the dark." "When an entity's actions agree with neighbors, the sensation is one of unimpeded momentum, of pleasure. When there is a difference in actions, the sensation is one of stopped or slowed motion, of pain. The absolutes of space or mass, continuous consciousness or unconsciousness, are always richly pleasurable in feeling. Energy relations, however, can easily be painful, because rapid vibrating introduces another sort of behavioral difference: being out of synchronization. One vibrating entity may be expanded whenever its neighbor is contracted, and vice versa, repeatedly. Each is always aware of an unconscious neighbor who is painful to be near, and who does not move away. Let us dwell on this situation, because it is the key to all the undesired feelings in the universe, including those in our human lives. Energy is the devil, the tease, the thrill, the delinquent, the messenger who delivers only half the message, the marker of time. Energy promises dominion over the world. It accumulates endless details of information. It creates forms and systems and destroys them. It has beginnings and endings, monotonously repeating changes, and therefore time belongs to energy relations. It is the outside agitator. It has unforeseen side-effects. It is explosive and excessive, and there is never enough of it." "Love & Pain is practical I wanted information for myself I could rely on. I am not a carefree reader; I am a corrosive critic of current stuff. I did a lot of theorizing before writing The Guide, actually writing it in a spaced-out condition. Then I realized it wasnt enough, I had to figure out the local reality we are in, 'that which happens regardless of what anyone thinks about it. When my first book was published, I considered it was sufficient to read the first line of Chapter One: "We are equal beings and the universe is our relations with each other." Once that idea was installed in the mental computer, I thought, any mind could sort itself out. Perhaps others can give it better extension than I have. I wrote The Lazy Man's Guide to Enlightenment in language that any reader of English could understand, making it as easy as possible. Now, in writing Love and Pain, I decided to state the case as clearly as I could without regard to a general audience, as though I was writing to a friend, someone like myself. Over the decades, along with the problem of working out the book's concepts, I stewed over the difficulty of communicating them. There was a wide range of possible applications, and many levels of vocabulary at which the language could be pitched. At first I thought it would be best to write an imaginative work that might catch the attention of people better versed in sciences. There are great advantages in the information in this book: knowing how our reality works, we can avoid wasting emotions, time and effort in pursuit of false goals. Personally, I found great relief in realizing that I was not obliged to correct anyone's erroneous opinions, since ideas do not do anything. Also, I could stop criticizing myself for failing to dwell in constant bliss. When I encounter pain, it does not mean that I have necessarily been stupid: pain is inevitable in human life, whichever path we take. Neither am I obliged to rescue others from their pain: they will gain greater strength in enduring it and solving their own difficulties. That which offends the sentimental in the short run is often the greatest kindness over a longer time. I try to be kind to strong people because they have endured much to become strong. Power begins with the willingness to endure pain without changing. Everyone wants power. Even the New Age people want the world to bend to their thoughts. If Love and Pain proves to be practical, practicality will make it popular enough. I know there are enormous industries built on the flight from pain. The cost of medical care multiplies much faster than the rate of inflation, and the children of the middle class inherit little wealth. A better understanding of the role of pain in our lives might diminish such nonsense, but the net quotient of suffering will probably remain the same. I am not offering that sort of deliverance. What I do offer in Love and Pain is a clear understanding of the real benefits that any person may expect from prolonging consciousness. Consciousness does not give the power to control energy and matter. It is the power to push them away, to leave this reality and stay away. That is all consciousness does, but it is enough. The rewards are truly much more profound than anything we can enjoy on Earth. Find more information about this and other books by Thaddeus Golas is at The SEED CENTER BOOKS Website. please visit our International Sales Desk.